It may take two decades to mount a manned mission to Mars, but work is under way. The human race has finally set foot on the Red Planet. Kind of. “Today, as I see this Red Planet surface I can already feel how inspiring it will be to do it through the eyes of the first human to step on Mars. I salute the explorers of tomorrow,” Urbina said in a radio link-up with officials, cosmonauts and media at the control center. Smoleevsky also dedicated the sortie to the first human space flight, made 50 years ago this April 12 by Yuri Gagarin. 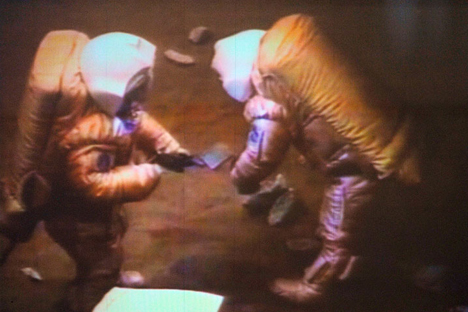 Remotely assisted by Chinese colleague Wang Yue, they performed atmospheric, soil and other tests that Mars explorers will one day carry out. They then planted the flags of Russia, China and the EU. The team of male volunteers, which also includes two more Russians and a Frenchman, went into isolation last June as part of the Mars-500 experiment to gauge the physical and psychological effects of a long-term mission. Before they rejoin life on Earth, their handlers will subject them to the claustrophobia, stress and fatigue that real spacefarers experience. The experiment is being conducted by the Moscow-based Institute for Medical and Biological Problems in collaboration with the European Space Agency and China’s astronaut training center. Their simulated craft comprises several interconnecting modules, including a greenhouse where fresh produce is grown, and with living quarters just around 20 yards long and less than four yards wide. There is a built-in Martian surface model for three planned space walks. During the simulated flight, the team has an internet link to Earth, but this is deliberately prone to the breakdowns anticipated during a trip to Mars. Depending on its orbit, Mars is located 35 million to 250 million miles from Earth. While the main condition of space travel – weightlessness – is missing, the crew sleep in bunks at a 12-degree angle to create a feeling of unfamiliarity. A similar isolation trial at the institute 11 years ago broke down when a Canadian volunteer said a male colleague tried to forcibly kiss her. Two other team members came to blows. But there is plenty of time to get the crew dynamic right: Experts do not expect a manned Mars mission until the mid-2030s.